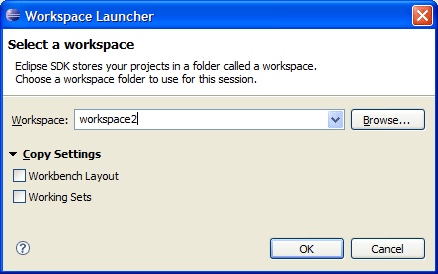 The current workspace for Eclipse can be switched by using the File->Switch Workspace command. If you have already switched your workspace previously the previous workspaces will be available for selection in the Switch Workspace menu. The Switch Workspace --> Other.. menu item will open the switch workspace dialog. The dialog will allow you to browse for or manually enter a new workspace location. The combo will also allow you to select your previously selected workspaces. When you switch your workspace you can select settings than will be transferred to the new workspace. These settings are supplied by the org.eclipse.ui.preferenceTransfer extension. Workspace Layout: Opened views, their size, and selected perspectives. Working Sets: The user defined working sets.